Having only invested in what is now the largest Monforts Montex stenter installation in Europe three years ago, Portugal’s Riopele has placed a new order for a further machine of similar dimensions to be delivered before the end of 2018. As the owner and third-generation chairman of Riopele – a company established by his grandfather with just two water looms in 1927 – José Alexandre Oliveira has adopted a successful strategy of forming much stronger ties with both customers and suppliers in recent years. Riopele’s customers, it should be emphasised, are some of the biggest high-end and luxury brands in the world, including Armani, Hugo Boss, Burberry, Calvin Klein, Karl Lagerfeld, Massimo Dutti, Paul Smith, Versace, Max Mara, Victoria Beckham, Sandro and Maje. It’s certainly a strategy that is paying off – between 2012 and 2016 the company, with 1,025 employees, achieved an average annual turnover of €71 million with an EBITDA margin of 8.5%. In 2017, Riopele enjoyed its best year to date, with sales climbing to €74 million and an EBITDA of 15%. The headcount at the plant in Pousada de Saramagos near Porto has meanwhile increased to 1,069 people. 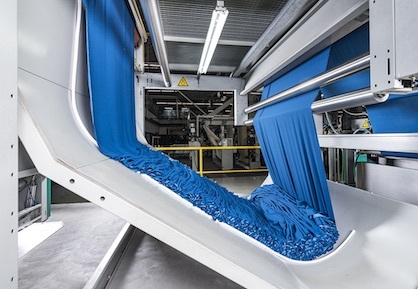 Entirely vertically integrated, from raw material to finished fabric, Riopele has a monthly output of around 700,000 metres of fabrics based on synthetic, natural and recycled fibres, with a specialisation in polyester, viscose and elastane blends. Production is 24 hours a day, over three shifts and the company’s key fabric brands are Çeramica, Çeramica Clean, Tecnosilk and Tenowa. 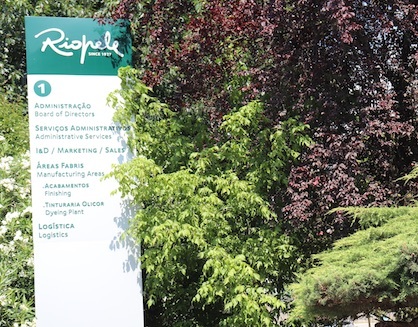 Riopele’s strategy of close partnerships also extends to its technology suppliers. 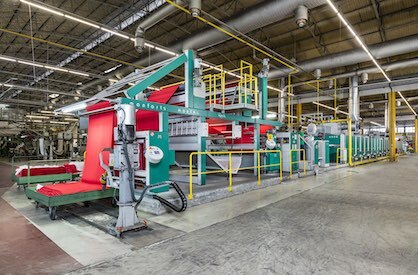 Over an area of 140,000 square metres, the four-hub Pousada de Saramagos plant is equipped with some 30,000 spindles, ten winding machines and over 60 twisting machines, as well as 204 weaving machines. The company’s finishing operations are divided into three stages – preparation, dyeing and finishing – with a wide variety of processes enabling the fine tuning of colour, touch, gloss, look, function and fluidity. 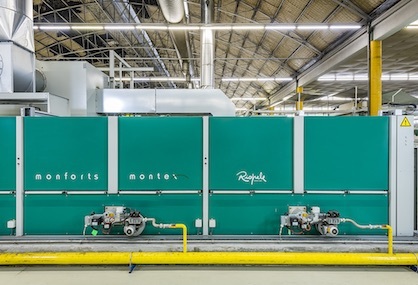 A long-standing partner with Monforts, Riopele has a variety of the German machine builder’s equipment, and dominating the finishing department is the latest Montex stenter, with 12 chambers and a full installation length of some 70-metres. The line was installed as part of a €14 million investment programme between 2014-16. The next ten-chamber Monforts Montex stenter which is currently being built will be operational in 2019, as part of a new €10 million investment plan. “We need close relationships with the suppliers of our equipment, who we know to be the best in the world,” says Mr Oliveira. “When partners like Monforts develop something new, we trust them to tell us about it straight away so we can incorporate it into our forward planning. “It’s no longer like in the past, when you would wait until the next ITMA to discover what they were unveiling. This is just the same as the expectation from the brands – they can no longer show garments that will be available in six months’ or a year’s time, because consumers are now geared to having things they want immediately. These expectations have totally changed how everyone operates along the entire supply chain. “Our ongoing investment in technology is critical to keeping ahead in the market, but just as critical is our investment in our people,” he adds. “Building on our know-how of 91 years and passing it on to the coming generation is of extreme importance. This is being achieved through our internship programme, research and development programmes with research centres and universities, and special initiatives such as open space R&D hub, bringing together our research, development and product engineering teams. “All of this equips us for future success,” Mr Oliveira concludes.